Yes that's right, making a full come back to our old lovely little spot in the heart of the CBD to rattle the streets with the most superior sound Brisbane has to offer. We are going in proper once again with the most majestic music on earth. Dub, Reggae, Dancehall, Drum & Bass, Jungle! Ragga sound fi-dem Junglist kind! 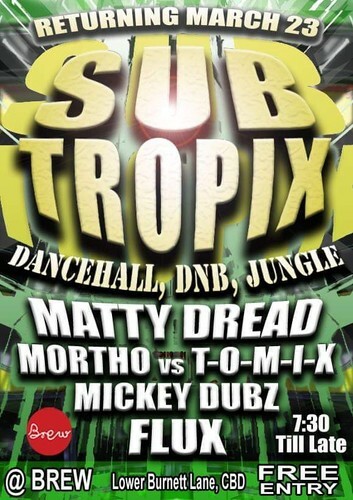 With the one like Matty Dread at the helm with a top notch install this will be an unforgettable night! Brew as always been a fantastic little boozer right in the middle of the city, with a great selection of beverages, some lovely stuff on tap, and the kitchen is just superb. Friendly fun passionate staff and an all round great vibe. Bring your dancing feet and a positive vibration.